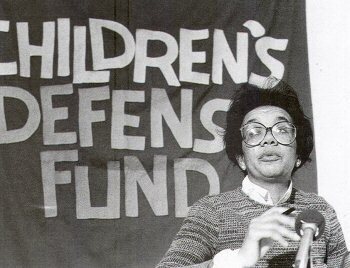 Marian Wright Edelman (born: June 6, 1939) is an American activist who, in 1973, founded the Children’s Defense Fund. She was the first African American woman admitted to the Mississippi Bar. She worked on racial justice and civil rights issues with the NAACP fund’s of Mississippi. She also helped establish the Head Start Program. In DC in 1968, she organized the Poor People’s Campaign and Southern Christian Leadership Conference. This is when she became interested in issues related to childhood development. That interest would grow until she founded the Children’s Defense Fund, a group dedicated to he welfare of children who did not have a voice. Their work involved advocacy and research that led to influencing Congress to overhaul the foster care system and to supporting adoption. Winson and Dovie Hudson’s Dream. Cambridge: Harvard University. 1975. OCLC 49643782. American Children and Families. Washington, D.C.: Religious Action Center. 1981. OCLC 7968448. Families in Peril: An Agenda for Social Change. Cambridge: Harvard University Press. 1987. ISBN 0-674-29228-6. The Measure of Our Success. Boston: Beacon Press. 1992. ISBN 0-8070-3102-X. Kids and Guns: A National Disgrace. Washington, D.C.: Educational Fund To End Handgun Violence. 1993. OCLC 32644803. Guide My Feet. Boston: Beacon Press. 1995. ISBN 0-8070-2308-6. Edelman, Marian Wright; Adrienne Yorinks (1998). Stand for Children. New York: Hyperion Books for Children. ISBN 0-7868-0365-7. Lanterns: A Memoir of Mentors. Boston: Beacon Press. 1999. ISBN 0-8070-7214-1. The State of America’s Children. Boston: Beacon. 2000. OCLC 46480964. I’m Your Child, God: Prayers for Children and Teenagers. New York: Hyperion. 2002. ISBN 0-7868-0597-8. I Can Make a Difference: A Treasury to Inspire Our Children. New York: HarperCollins. 2005. ISBN 0-06-028051-4. The Sea Is so Wide and My Boat Is so Small. New York: Hyperion. 2008. ISBN 978-1-4013-2333-2.